Golden Black Gunpowder is one of two teas I purchased this week, both from the Bleecker Street Porto Rico store. I had not heard of this tea before but the name and look caught my attention. A more descriptive name might be Golden Gunpowder Black Tea as it is a black tea rolled in the gunpowder style. The Tea Table website recommends one-half teaspoon per cup steeped for three to five minutes. 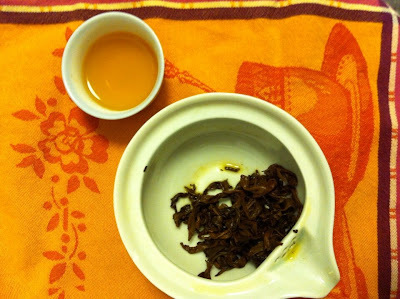 I used one teaspoon in a gaiwan steeped for one minute intervals. The temperature of the water was about 190°F. Teavivre recommends 185-194°F for traditional green gunpowder. Now for the taste. The tea is delicious and complex! I detected caramel in later infusions but in earlier infusions, a pleasant astringency upfront followed by a creamy nuttiness and also a slightly woodsy flavor. The rolled leaves are beautiful with their golden tips and when unfurled are long and intact. 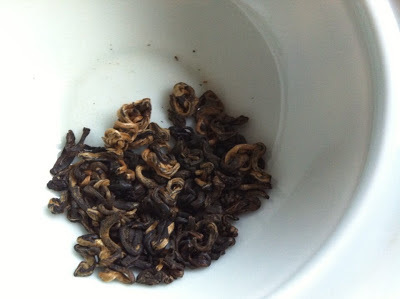 I've mostly prepared this tea without milk; when you steep a tea in a gaiwan, milk does not seem appropriate. But, I did drink a cup of it with milk and it reminded me of a smooth Assam so it is also a good choice for those who like to drink black tea with milk. Please let me know if you drink this tea with milk.